WHAT AREAS DO YOU COME TO? 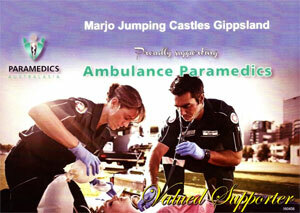 VIC: We service all of Gippsland. People are surprised that we service their area, as we do a lot of the areas in these regions; please feel free to contact us to see if we service your area. Once your booking has been secured, you will receive an email of confirmation, a copy of our terms & conditions and an information sheet about your castle. Yes, a deposit of 30% is required to secure your booking. Once you have contacted Marjo Jumping Castle Hire to reserve a booking we will hold that date for 48 hours to allow you transfer/deposit funds. The preferred method is by telephoning us on 0403 030 766; alternatively you can go to the contact page and e-mail us. You can book any time however bookings can fill quickly so please book as early as possible to avoid disappointment, especially September through to May. Prices start from $180 for a whole weekend but can vary depending on the size of the Jumping Castle, location and length of hire, etc. Please see Our Castles page for all prices. Remember that these prices are a guide and may be higher depending on setup conditions. Simply contact us for your obligation free quote. All prices include local delivery, set up, inflation, collection and all accessories required to operate the jumping castle safely. A fee may need to be charged for out of area deliveries. Please contact us for delivery rates. HOW LONG CAN I HIRE THE JUMPING CASTLE FOR? Our castles are available for half day (4) if requested, but mostly all day (8 hours), overnight or even a weekend. Please see Our Castles page for all prices. Longer hire terms can be negotiated. Please contact us for your obligation free quote. Payment can made at the time of delivery by cash, bank cheque or money order. Direct Debits can also be made with details exchanged once a reservation has been confirmed. Personal cheques are accepted, but must be presented at least a minimum of 10 days prior to the booking date. The deposit taken is our booking fee and makes that Jumping Castle exclusive to you and unavailable for hire to another party. You need to provide us with at least 14 days notice of your intention to cancel; if this is not done then your deposit will be retained for any cancellations but can be used for your transferred date. Our rain and weather policy will put your mind at ease knowing that you are not paying for a Jumping Castle you cannot use. We will call you on the morning of the hire if the weather looks suspect and give you the option of cancelling or going ahead with your hire. If you choose to cancel due to weather you will not lose your deposit, it will be transferred to another booking/day with no expiry date. If you choose cancel and not to reschedule your deposit is non refundable. We will refund your deposit if we believe the weather is not suitable. If you decide to go ahead and your party gets washed out all you need to do is evacuate the Jumping Castle immediately, bring all electrical equipment out of the rain after turning off power at blower then the wall. Then give us a call and tell us to come and collect the Jumping Castle. If electrical equipment has been left in the rain you will be charged for repair or replacement of equipment. If you are worried about the weather you can click on the link below and enter your postcode to check a 7 day forecast. http://www.weatherzone.com.au/ NB: In the event of strong winds or rain, Marjo Jumping Castle Hire reserves the right to cancel the booking if we feel safety will be compromised. In this case we will contact you promptly to discuss the matter. Please feel free to ask any questions in regards to this policy. CAN THE JUMPING CASTLE BE SET UP ON A SLOPE? The jumping castles take approx 15 minutes to set up and 20 minutes to pack up. However this is only an estimate, times may vary depending on which castle you hire. No, we will set up the castle before the requested hire time starts and it will be taken down after the requested hire time concludes. We do request that there is clear access and there is room to manoeuvre the jumping castle to the set up area. We need a 1.5m wide clear access to deliver most castles. You will need to allow a minimum of 5m area for most castles. Our General Information page details all size requirements pertaining to jumping castle set-up. Please make sure all dog pooh, garden items such as garden toys, swings, slides, patio furniture, rubbish etc. are removed from the area where the castle is to be situated. WHAT SURFACE CAN THE JUMPING CASTLE BE SET UP ON? The jumping castle can go on grass, dirt, concrete, paving or asphalt as long as the area is flat, and there are no ridges (i.e. : between a change of surface). Please inform us if the jumping castle will be erected on a surface that does not allow for pegs to be used (i.e. : asphalt, concrete, paving). Additional fee may apply for set-up on hard surfaces. No, the jumping castle must be at least 1 meter away from any object. If the jumping castle is in contact with any object it may cause the jumping castle to suffer abrasion damage. Also there may be a safety issue if the children on the castle make contact with the object. No, please do not attempt to move the jumping castle once set up due to safety requirements. Penalties may apply if castle is moved. WHAT IF THERE ARE STEPS TO GET TO THE SETUP AREA? If there are steps you will need to notify us when making the booking as the jumping castles weigh between 100kg and 180kg and it is difficult to manoeuvre up and down steps. As a general rule: If there are more than 5 steps there needs to be someone on site that canhelp manoeuvre the jumping castle. If there are more steps please let us know when making your booking. We supply all the hardware you will need for the castle; you will need to provide a 240 volts mains power supply. Generators are available for hire if planned event is in a park. Yes all our castles are suitable for children up to and including the age of 14-16,sometimes older depending on the type of activity the clients choose to engage in. Prior to delivery day a member of Marjo Jumping Castle Hire will contact you to confirm all details and timings. On the day of your event, a Marjo Jumping Castle Hire customer service team will attend to your home or nominated location and completely install the jumping castle. This includes a pre-operational safety check and operational & safety instruction to enable you to supervise your jumping castle with peace of mind. WHAT SAFETY FEATURES DO YOUR CASTLES HAVE? All of our castles feature a properly designed entry way to ensure children can enter and exit the castle safely. Unlike many standard jumping castles with an open front or sides, ours have full safety netting which makes it almost impossible to fall out when children are inside the jumping castle. Our jumping castles are firmly anchored to eliminate the risk of tipping over. Our castles, power leads and blowers have all met Australian regulations and undergo regular safety checks. CAN THE CASTLE OPERATE ON WINDY DAYS? Yes they can, however stronger winds can be a bit too much for some of the castles. We have been forced to cancel some hires, but this is very rare. Some parents might get upset but your children’s safety is important to us. We strive to keep your events fun but most important safe! Yes. For the safety of the children who will use the jumping castle. A responsible adult over 18 years of age must supervise the jumping castle at all times. There will be training given in the operation of the jumping castle on the day of the hire. CAN YOUR STAFF SUPERVISE THE JUMPING CASTLE DURING THE HIRE? 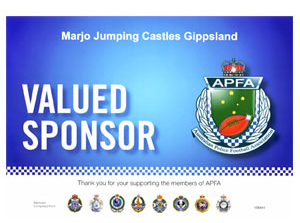 Yes, this is an additional charge of $40 per hour for a Staff member from Marjo Jumping Castle Hire to Supervise the Jumping Castle for the duration of your hire. If you require this service, payment must be paid in full at time of deposit. Our Friendly staff will supervise the Jumping Castle and insure that all rules are followed to insure the safety of the children. Please keep in mind, if you book our staff to supervise the Jumping Castle, they are there only to do that and not become part of the entertainment or service. CAN WE HIRE A JUMPING CASTLE FOR OTHER EVENTS? 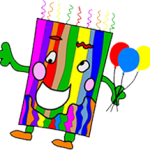 Yes, we provide Jumping Castles for all occasions such as birthdays, fetes, functions, corporate events, fundraising events, end of year parties and more! WHAT IS THE AGE OF THE CHILDREN THAT CAN GO ON YOUR JUMPING CASTLES? Our Jumping Castles are manufactured for children up to & including 14-16yrs of age. It is advisable that children of the same size jump at the same time, No overcrowding. Please keep in mind that children may be the same age but they may not always be the same size (height and weight), e.g. 4yr olds with 4yr olds as long as they are roughly the same size (height and weight) too. See below for further details. IS THERE A MAXIMUM WEIGHT LIMIT ON YOUR JUMPING CASTLES? Yes, there is weight limit. The weight limit varies depending on the size of the castle, but generally it is 450kg for the ‘jump’ style and 600kg for the ‘combo’ styles. Yes we have Public Liability Insurance for 20 Million dollars. We can supply a copy of the cover prior to your hire starting upon request. DOES YOUR JUMPING CASTLES HAVE ANY SUN COVER? Yes all our Jumping Castles are fully enclosed, while still allowing plenty of fresh air to flow through. MY PARTY IS IN A PARK, CAN I STILL HIRE YOUR JUMPING CASTLES? Yes, having your party in the park is lots of fun; it is your responsibility to get your local councils approval. Please confirm with Council that there will be power available for the Jumping Castle and don’t forget to let us know that your party will be in the park. A generator can be hired for a small fee. Please be aware that streamers, poppers, silly string, face paint, chewing gum, food and drink MUST be kept away from the jumping castle at all times. Excessive mud or dirt is required to be cleaned prior to our staff collecting the castle. If any of items above come in contact with the jumping castle and it damaged, it will be considered malicious and you will be liable for the full cost of repairs, transport costs associated with the repairs and the loss of business costs while the castle is repaired. A $100 on the spot cleaning charge may be applied to any castles requiring cleaning when collected. If you have any other questions, please feel free to ask. A full copy of the Marjo Jumping Castle Terms and Conditions is printed on the back of every invoice which the Hirer is required to sign upon delivery and set-up of the Jumping Castle. So book with the best jumping castle hire company and you won’t regret it.